Cherie Mercado has resigned from her post as spokesperson of the Department of Transportation. Mercado, who was appointed for the said post last year, said she left the department since she couldn't balance time for her family with the demands of her job. "I loved my work. The learnings that I had were invaluable. My colleagues were top-notch achievers who were sacrificing fat paychecks and comfortable lives to give back to government. I've met the most wonderful people, the hardest workers, the most efficient but humble Filipinos. They were truly a joy to work with," she wrote in a lengthy Facebook post Thursday. "I was trusted, challenged and made to be part of the important things we do. There was always purpose to the hard work," she said, adding that her boss, Secretary Arthur Tugade, "provided the leadership and the inspiration." 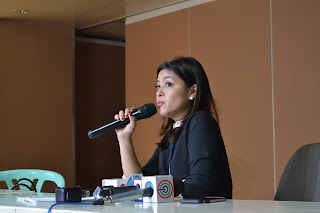 The former Kapatid news anchor said it was a tough decision for her to leave DOTr, but she has "tried for the last few months to balance, but I failed. And then I knew it was time to choose." "I saw my daughters fighting, grades going down, my seeds of teaching respect slowly forgotten, spending too much time on the iPad. They could be having seizures beside me and I might not notice because work is constantly demanding my time and attention," she said. "My husband was supportive all throughout but I know he was feeling my absence." Mercado joined DOTr in July of last year after a more than a decade stint on TV5. She was last seen on the network as the co-anchor of Aksyon Sa Tanghali, alongside Raffy Tulfo.